- The federal government is working on a measure to bypass the statutory debt ceiling to accommodate additional spending initiatives. - US equity markets as a whole are reliant on corporate tax cuts and infrastructure spending to a smaller extent to justify their current valuations. - If these expansionary fiscal moves don’t come to fruition or underwhelm the market’s expectations, stocks are likely to drop. Argument: Markets naturally trade on future expectations. Currently, US stock valuations rely on a necessary degree of public debt expansion. On its own, the federal budget is currently infeasible to balance due to ongoing trends in federal expenditures. The debt expansion most relevant to the US stock market includes the Trump administration's initiatives to lower corporate tax rates and increase infrastructure spending. These plans will be challenged by fiscal conservatives, those who object to decreased government revenues through tax cuts generally, and through statutorily imposed debt limitations by the federal government. Nevertheless, despite the harmful long-term effects of credit expansion exceeding the rate of nominal growth expansion (i.e. lower future growth), US stock markets are banking on the idea of these fiscal initiatives being implemented, and are time sensitive due to the way in which businesses are valued. Should ideological conflicts or legal snares (regarding further debt issuance) challenge the implementation or eventual structure of the administration's intended expansionary fiscal measures, stocks are likely to give back a portion of the gains attributable to these expectations. US stocks are currently stuck in a holding pattern, which, as I articulated in a different article, is predominantly due to the influences of Federal Reserve tightening, lack of clarity on the timeline regarding fiscal reforms, and (to a lesser extent) overestimated inflation expectations. Investors greeted the Trump administration's intended policy enactments warmly given the corporate tax reform and various deregulatory initiatives are designed to expand corporate earnings, which is the main cash flow source, of which businesses are valued. Nonetheless, to go along with increased defense and infrastructure spending, these policy initiatives are not cheap, could decrease federal revenue uptake (at least initially), and will require a further expansion of the national debt. Infrastructure spending is a lower-priority initiative and will have push-back among fiscal conservatives wary over its effect on widening the federal deficit, which was already 3.2% of GDP in 2016. The reported cost of such a plan is generally taken to be around $1 trillion, or 5.3% of the US's $18.9 trillion GDP. For the national debt to rise, Congress will need to support a lifting of the national debt ceiling. The figure is currently at $20.1 trillion, or just a hair above the $19.85 trillion figure as of March 16, 2017. By around the third week in April, the debt should hit the $20 trillion mark. By mid-May, it's projected to hit the $20.1 trillion ceiling in place. Raising the ceiling will be mandatory for the Trump administration to push through its objectives regarding corporate tax reform. Nominal corporate rates are expected to be dropped down to around 20% from 35%, which would put US rates more in line with those of other developed economies. Effective US corporate tax rates approximate 21-22% and corporate profits are 8.4% of GDP at close to $1.6 trillion when including inventory valuation adjustment and capital consumption adjustment. The drop from 35% to 20% would project to raise the fiscal deficit by $150-250 billion, or 0.8-1.3% of GDP. The expectation is that lowering the cost of doing business in the US will result in much of, all, or more than this amount eventually being recouped through higher growth. It would also depend on whether a workable proposal is formed in conjunction such that offshore cash can be repatriated with a portion flowing in as federal revenues. While much of corporate tax overhaul is already priced into stocks, implementing this in time for the 2018 fiscal year would likely push the S&P 500 (NYSEARCA:SPY) over 2,400. A failure to raise the US debt ceiling - or a continued delay in this plan even with a ceiling increase - would lead to some dip in equities attributable to this expectation. 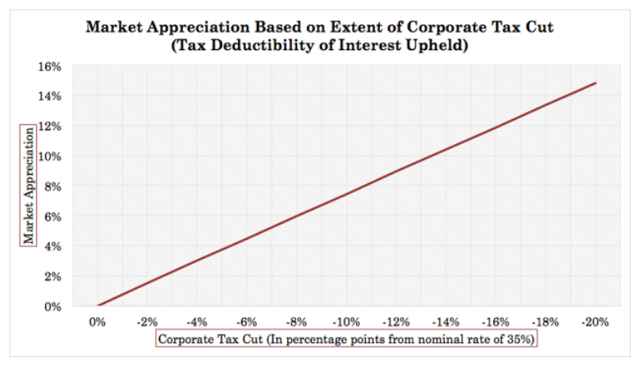 I projected that reducing the corporate tax rate from 35% to 20% - while keeping the tax deductibility of interest in effect - would increase US stock valuations by about 11%. Naturally only some percentage of this projected 11% is priced in, given the probability of policy delays or no material changes to the tax code altogether. What amount is priced in is difficult to ascertain, though a sizable chunk of it (~70% or more) likely is. The S&P 500 is up 11.6% from its 2,132 close on election day. Additional factors behind the market's rise come in the form of increased odds of deregulatory initiatives and infrastructure spending, higher inflation expectations, and general corporate earnings growth. As for the timing, the statutory deadline to raise the debt ceiling was March 16. That's already passed. However, it's not a hard deadline. The Treasury Department has tools it can use in the interim to circumvent the debt ceiling's legal grounding. The easiest method is to declare a debt issuance suspension period, in which it can meet federal obligations without default or a partial government shutdown. Current Treasury Secretary Steve Mnuchin put this into effect on the day of the deadline. This in effect halts investments into government employee pension plans. This will stay in effect until July 28 and gives Congress several more months to raise the limit statutorily. This measure was previously used by then-Treasury secretary Timothy Geithner back in April 2011. However, an extension does not mean that free spending will be in order and that the market will get the additional fiscal-related jolt that it's currently pricing in. It's possible that Congress will tie upcoming increases in the debt ceiling to a piece of legislation. Over the past 10 years, debt has expanded at an annualized rate of 8.7%. Over the past 20 years, it's risen 6.8% year over year. This compares with annualized nominal GDP growth of 3.0% over the past 10 years and 4.2% over the past 20 years. If we look at the ratio of debt at the federal, corporate (excluding financial), and household level to that of nominal GDP, levels rose from 1983 to 1995, before plateauing between 1995 and 2008, and increased dramatically during the financial crisis. Credit expansion is still rising, though at a less rapid pace. Every recession is fundamentally caused by credit expanding at a faster pace than nominal economic growth. Placing restraints on public debt expansion becomes increasingly necessary as the Fed looks genuine in its intentions to tightening monetary policy after 8-9 years of ultra-low rates (Rates still remain negative at -1.6% to -1.8% in real terms). At $20 trillion, each 100-basis point linear shift of the yield curve would tack another $200 billion onto the federal deficit, equal to 1.06% of GDP. Net interest on the debt is already about $260 billion. An extra $200 billion would raise debt interest as a percentage of total government expenditures from 6.6% of GDP to 11.1%. The worse the situation gets, the less the government has to spend to support the economy in other respects. This will eventually lead to measures such as cuts in government spending and/or an increase in tax rates, both of which are contractionary fiscal measures. Or alternatively, there must be an alteration in pre-existing spending programs. Medicare/Medicaid and Social Security alone account for 53% of total federal expenditures and 11% of GDP. With the aging of the US population (average age is expected to hit 44 by mid-century, up from 38 currently), these programs are expected to account for an even greater proportion of the budget, as entitlement spending goes up while the proportion of working-age citizens decreases in conjunction. Taking in skilled foreign labor is one option to mitigate these demographic headwinds. But the US economy must first be capable of sufficiently employing its own labor base while being able to incentivize business investment to facilitate the creation of these Jobs. It seems unlikely that the debt situation in the US will ever be resolved and we are still a decent ways from obtaining a balanced budget. With a US taxpayer base of around 120 million, debt per taxpayer comes to nearly $170,000. It's unnecessary to whittle the debt back to $0. But it does need to remain on pace with or lower than nominal GDP growth to avoid the future economic ramifications of even lower growth as debt payments take up a greater proportion of public expenditures. For now, however, the US equities markets are reliant on a degree of debt expansion in the form of corporate tax rollbacks, and, to a lesser extent, infrastructure spending. Credit expansion beyond income growth has a deleterious long-term impact but is necessary to meet the market's demands in the short term. A failure to achieve some or all of these policy objectives in timely fashion will likely be met with a drop in stock prices.